From craft brews and hand-crafted pizzas with local ingredients to its famous mac & cheese and decadent desserts, Stella Public House roots itself in the East Village restaurant scene. San Diego’s East Village is making waves in the city’s culinary scene. The gentrification process of the neighborhood most easily recognized as “East of the ballpark” is due in large part to the arrival of several trendy restaurants. These foodie destinations continue to catch the attention of America’s Finest City and the culture built on craft brews and fresh, local ingredients. Stella Public House is one such restaurant that has created a menu of gourmet “farm to pizza” style cuisine. The restaurant will celebrate its one year anniversary in November, but has already rooted itself in the neighborhood as a popular lunch, happy hour and dinner locale. The modern open-air architecture with rolling garage doors takes full advantage of the always-sunny-and-seventy-degrees San Diego weather. Executive Chef Giovanni Novella oversees ten different wood-fired pizza options with mozzarella made daily in-house, house-made dough and organic produce from local growers. Local farmers include Wieser Farms, Fresh Orgins, Archi’s Acre, Scarborough Farms, Mountain Meadows, Gloria Tamai and more. 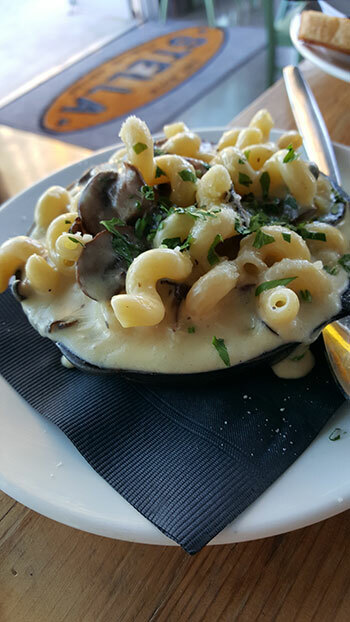 Other menu standouts include the caprese salad, speck wrapped asparagus, lamb meatballs and wild mushroom mac & cheese with smoked gouda, parmesan and truffle oil. After sitting down at Stella’s table, the two most difficult decisions a diner must make are what to order off the menu and whether or not to save room for dessert. With sweet options ranging from budino (chocolate with sea-salt carmel and whipped cream) to panna cotta, tiramisu and chocolate salami (dark chocolate and honey biscuits served with vanilla gelato), the ability to suddenly make room for dessert seems to occur with remarkable speed. Stella Public House also stays on point in tempting San Diego’s beer enthusiasts with 30 rotating brews on tap featuring both local beers and those from around the country.